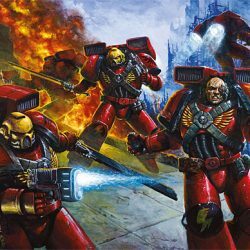 It’s been a busy couple of weeks where I’ve not had a chance to do any hobby work apart from a partical assembly of a Drop Pod and planning out a 1750 Blood Angels marine list. This is where my years of not playing thinks that I have a decent plan for a list but I wanted to throw it out to all of you to see what you think of it and if possible can you leave me some feedback in the comments about it. Aside from that I should be getting back to some painting next week where I have less on my plate so you’ll see more if what I have coming soon.